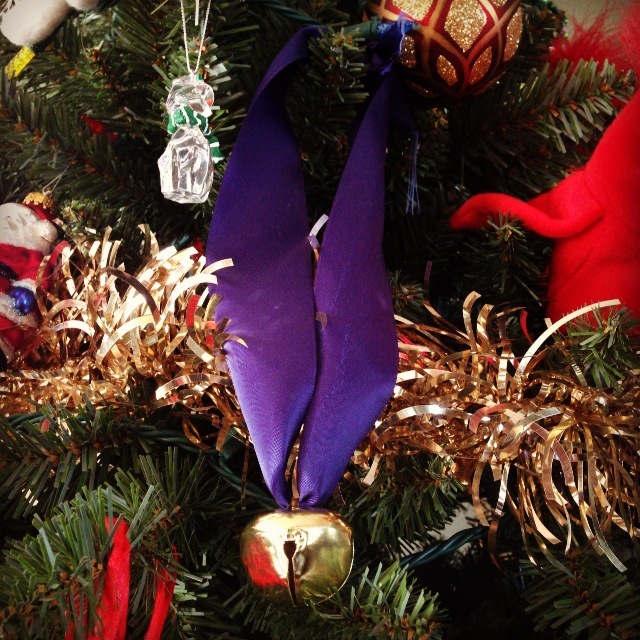 Jingle Bell 5k and 18 weeks ’til Boston! The last few weeks have been filled with powerful workouts followed by crappy workouts followed by good ones. 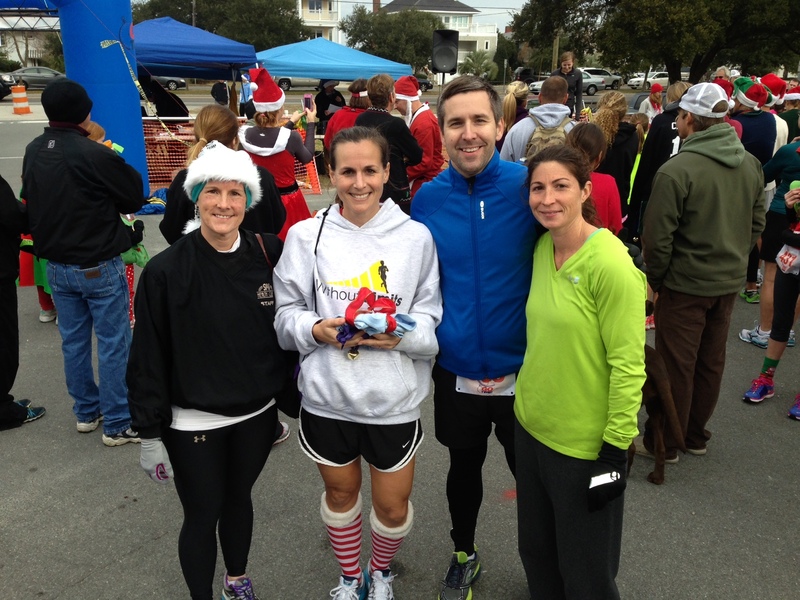 Thankfully, I felt back to normal by mid-week last week and I mentally geared myself up for the Jingle Bell 5k at Wrightsville Beach on Saturday morning. On Friday night, we attended my sister’s annual Christmas party, filled with mimosas, my brother-in-law’s awesome home brew, wine, and lots of socialization. Late into the evening, we started playing the game “Cards Against Humanity”, a game that should only be played by non-judgy people. We laughed so much, our abs and cheeks were sore. Hilarious. It had been a while since I’ve had so much fun, so I didn’t mind staying up until probably 1:30 am! I guess that wouldn’t have been a terrible thing had my alarm not been set for 6 am to prepare for the 5k. Oy, I certainly cannot do that as easily as I used to! Being goofy while playing one of the funniest games ever. 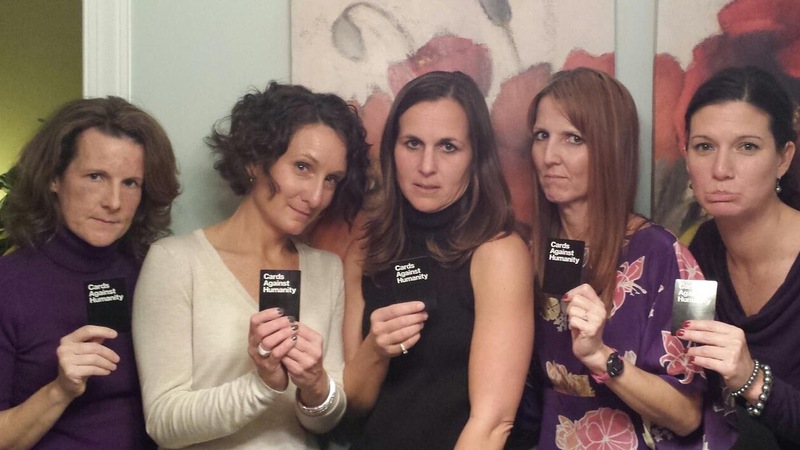 Cards Against Humanity. After snoozing a few times, I dragged myself out of bed at 6:30 to eat a banana and some oatmeal, figure out what I was going to wear, and stretch. I picked up my sister at 7:30 and we headed to Wrightsville for packet pickup and a pre-race jog. Many of my running group members were there and I was happy to do my warm-up with one of them. It’s always nice to run with other people! My plan for the race was to run as fast as I could, or at least get under 23 minutes. Secretly, I wanted a PR, but I knew it would be tough to do. I wasn’t feeling the best due to the activities the night before, but I was feeling good enough and ready to run. The horn blew and I took off. My Garmin showed that I was going around 7:05 pace, which is exactly what I wanted. THEN, between mile 1 and 2, I felt my breakfast slowly creeping up where it shouldn’t go, so I slowed to what my watch read was a 7:30-ish pace. Ok, I was good with that. It saves time to just slow down rather than stop and puke, right? When we rounded the last corner around mile 2-2.5, I saw the building where the race finished and knew I needed to kick it a little bit. As I got closer, I heard the coaches yelling “good job” and I felt like I finished strong. My clocked time was 22:00. Argh! ONE SECOND and I could have had a sub-22! While I was thrilled to do that well, I often think what I could have done had I not slowed down (or stayed up waaaay too late). Honestly, I was happy with my run, especially considering how late I was up!! A little side note here. For 5k races, I depend on my watch for paces. I’m unfamiliar with a 7 minute mile “feeling” since I normally run my tempo runs at 7:30 – 8 minute miles or somewhere near that. This is the second time this watch hasn’t shown the correct race distance as I crossed the finish line, so now I realize that my pace was showing incorrectly as well. Which is probably why I felt like my breakfast was going to come back up. I’m ok with this for shorter races, but it really is a testament to knowing your pace and being able to run the pace you want and know it, rather than depending on a watch. I’m about ten seconds off my PR, so I’m now determined that I’m going to pick out a 5k to run and take it down. PR, here I come!! So close two times in a row!!! I was happy to find out that I won the female masters division, and finished 27th overall of 550+ runners. They read someone else’s name when it was first announced, and come to find out, she was in her 30’s. I was talking to my husband, who was buying Red Sox/Yankees tickets four our trip to Boston at the time, so I totally missed that they corrected and then re-announced my first place finish. I headed to the podium (an actual podium!) and stood up there, hoping to not make a fool of myself because I really didn’t understand what was going on. Dur!! PAY ATTENTION NEXT TIME!!! I won a nice bell, plus an entry into another race. I’m currently trying to figure out which 5k to run, the one that shall be mine (rubbing hands with a maniacal laugh). My prize for winning the Female Masters division. I realized today that the Boston Marathon is now 18 weeks away. It’s hard to believe it’s getting so close. I have SO much work to do, but I know I have a good base to grow from. I AM SO EXCITED!!!!!! Sadly, the 5k Saturday was my last race of 2013, and I look to 2014 with so much hope, excitement, and just, well, happiness. I’m lucky in life and know that I can dream beyond anything I’ve ever imagined before. No Fear.